What do you think the future will look like in 2050? Free for anyone under 18. Y membership not required to participate. The Buildings and Grounds Committee of the McDowell County Board of Education will meet on Monday, April 22, 2019, at 12:00 noon at Eastfield Global Magnet School. The purpose of the meeting will be to look at property at the entrance road. No action will be taken at this meeting. Stop the Melt-Down before it happens! Child care provided – Advance Notice Required! If you need more information and/or childcare. The McDowell County Board of Education will meet at 6:30 PM on Monday, April 8, 2019, in the Board Room of the Central Office, 334 South Main Street, Marion, NC. The Buildings and Grounds Committee of the McDowell County Board of Education will meet at 12:00 noon on Thursday, March 14, 2019 in the lobby of the McDowell County Schools Central Office, 324 South Main Street, Marion, NC. The purpose of the meeting will be to review a parcel of property. No action will be taken at this meeting. 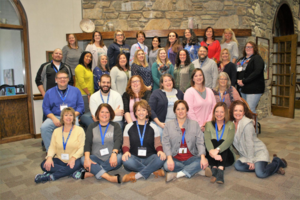 Feb. 4-7 Twenty-eight teacher leaders from across all 14 McDowell County Schools participated in advanced training at NCCAT, Cullowhee. With sessions ranging from data use to improv, participants chose workshops that matched their own personal and professional goals. The culminating activity was a presentation of a wide variety of Passion Project Proposals designed by the teachers to solve real needs in the community and will be carried out over the next five months at their schools. The McDowell County Board of Education will meet at 6:30 PM on Monday, March 11, 2019, in the Board Room of the Central Office, 334 South Main Street, Marion, NC.